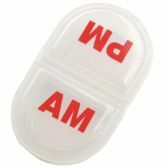 Plastic Water Bottle - 28 oz, 8-1/4"
Pocket Pill Pack 3" - A.M./P.M. Travel Mug, 16 oz. PDQ, 16 Piece., 7-1/2"
Stainless Steel Coffee Mug 16oz-. 7.25"
Scissors Barber - Stainless Steel, 7"
Silicone Spatula, Wood Handle 12"
Small Silicon Spatula - Wood Handle 9"
Silicon High Temp Spoon Spatula 12 1/4"
Silicone Spatula, Red - 11"
Silicone Spatula, Blue / Green 11"
Silicone Spoon Spatula, Red - 11"
Silicone Spoon Spat., Blue / Green - 11"
Silicone Jar Spatula, Red - 10"
Mini Whisk 3 Piece Set 5 1/2, 7, 9"
Mechanical Whisk - White 12"